Auslogics Duplicate File Finder - Free up disc space and avoid confusion ~ Android Forever! "Do you have any idea, how many duplicate files are stored on your computer? You may experience lack of free space, while there may be gigabytes of unnecessary duplicates. 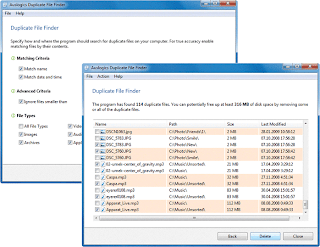 Auslogics Duplicate File Finder will help you to get rid of those files. By using this powerful yet free utility, you can increase free space on up to 50%."